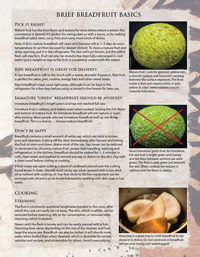 A free, essential guide to selecting fruit for cooking, avoiding sap problems, and easy cooking techniques. Learn the proper stage of maturity too look for when harvesting or purchasing at the market, as well as what stage of maturity to avoid for most dishes. 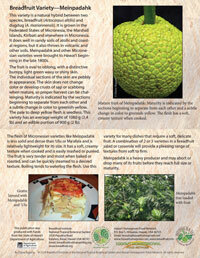 This a quick and easy guide for everyone who wants to include more breadfruit in their cooking. An excerpt from the guide, "Mature fruit has the best flavor and texture for most dishes where a potato-like consistency is desired. 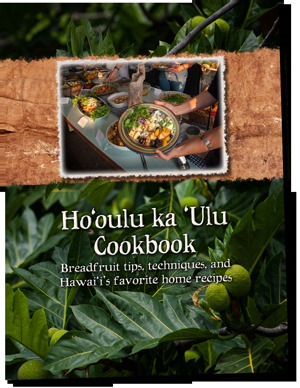 It’s perfect for eating plain or with a sauce, or for making breadfruit salad, stew, curry, fries and many more kinds of dishes." Download the 2-page guide. 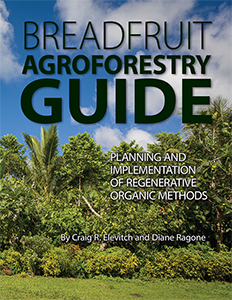 A free guide to breadfruit nutritional value and versitility as a food. 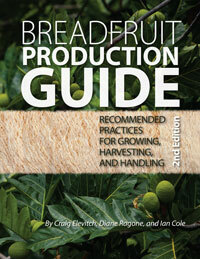 How does breadfruit stack up against imported starches such as potatoes and rice? 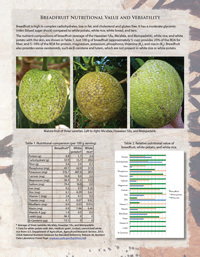 Once considered "famine food," breadfruit is now known to be a versatile staple that can be used in appetizers, main dishes, and desserts. 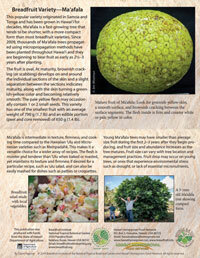 Recent work by the Breadfruit Institute of the National Tropical Botanical Garden on breadfruit nutrition reveals some interesting facts about how nutritious breadfruit is. 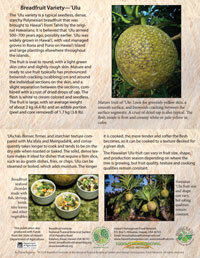 This guide also gives examples of the different kinds of dishes that can easily be made from breadfruit. 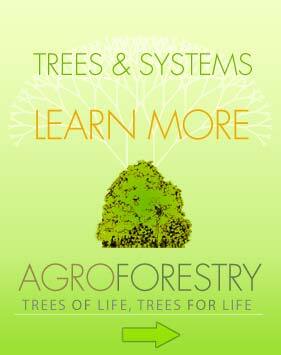 Download the 2-page guide.